The Sainsbury Institute was a creative driving force behind the exhibition. The initial idea came from Research Director Professor Nicole Coolidge Rousmaniere, and we have been honoured by supervision from Professor Emeritus Kobayashi Tatsuo of Kokugakuin University who is one of the Institute’s Senior Advisors. The connection extends to myself, for I am an ex-Robert and Lisa Sainsbury Fellow at the Sainsbury Institute. My role at Miho Museum was to help the curator Azuma Yōko set up the exhibition, work which included selecting artifacts, negotiating their loan and designing the displays. A particular feature of this exhibition is that many of the Jōmon dogū are in good condition, so their extraordinary charm can be readily accessed and enjoyed. 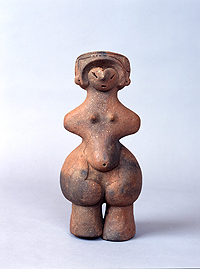 Visitors can also discover more about the crucial archaeological characteristics of these figurines, such as the significance of their poses, the meaning of their numerical content and changes in style over the period of their production. During the Middle Jōmon period from 3500 to 2400 BC dogū were created in some distinctive postures. Dogū in the arms-outstretched pose have been found widely throughout eastern Japan, from the Chūbu to the Tōhoku district. 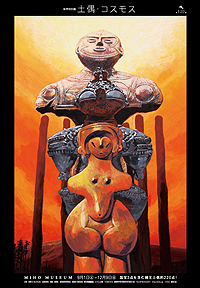 The ‘Jōmon Venus’ and slab-formed dogū from the Ishigami site, an Important Cultural Property, share the pose of having both arms held horizontally out to the side .The presence of large numbers of dogū with arms hanging down in the Kantō region from the same period suggests that the arm pose was a cultural choice. It seems clear that the arm poses were not the result of technical limitation but were rather part of the symbolic meaning of the figurines. 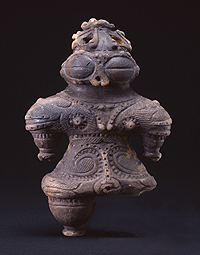 Jōmon artifacts include shapes that are considered to express numerical meaning. Three-fingered dogū and the three-fingered human figure motif on pottery appeared in the Middle Jōmon period, so the number three appears to hold special significance. 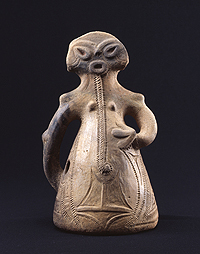 The odd numbers 3, 5, and 7 seem to have been a focus of attention in the Late Jōmon period, between 2400 and 1200 BC, and surviving vessels indicate that different meanings or purposes were ascribed to these numbers. In Gallery 6, the largest in the exhibition, the row of twelve Shakōki or goggle-eyed dogū from Tōhoku district reveals fascinating archaeological evidence, since it tracks dogū development and decline through the Final Jōmon period, from1200 to 500 BC. We can easily identify the arc of these changes by focusing on the face, especially the eyes. The goggle-eyed dogū fall into five distinct phases. In the first phase the eyes were almond-shaped ellipses, in some cases on a slight slant. During the second and third phases the eyes grew bigger and rounder to cover a large area of the face. In the fourth phase the eyes became smaller and by the fifth phase the goggle-eyed forms had disappeared. The exhibition also shows dogū in their more typical condition; In Gallery 3, about 110 pieces of dogū from the Meotoishi site in Yamanashi prefecture indicate that almost all the dogū were purposefully broken and the pieces distributed to different places. Gallery 10 is entitled, ‘The Fascination with Jōmon in the Modern Era,’ and it is here that contemporary artists, writers and cultural figures introduce their own work or their personal collections of Jōmon artefacts. Among those who have contributed to this element of the exhibition are novelist Kawabata Yasunari, folk craft movement pioneer Yanagi Sōetsu, textile designer Serizawa Keisuke, potter Hamada Shōji, poet Sō Sakon and manga artist Hoshino Yukinobu. The smiling face of a modern-day dogū, Okamoto Tarō’s Young Dream, or ‘Wakai Yume,’ is seen as visitors leave the exhibition space and descend the stairs. My first experience of displaying Jōmon artifacts was the exhibition ‘Flaming (Kaen) Pottery: Reading Jōmon Motifs,’ at the Fitzwilliam Museum in 2001, which I worked on with Dr Simon Kaner, Head of the Centre for Archaeology and Heritage of the Sainsbury Institute. We published a general book Jōmon Reflections, as a related product. We are delighted that on October 21st the Sainsbury Institute’s Research Director Professor Rousmaniere came to Miho Museum to give a lecture related to the current Dogu exhibition. The Institute and its staff have had a significant role in the development of research and exhibitions of Japanese archaeology, but despite its growing international reputation and extensive research network both in Japan and beyond, it is as yet comparatively little known within Japan as a resource for the study of Japanese arts and culture. 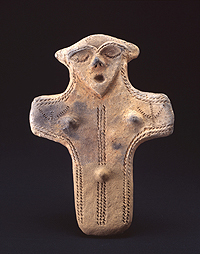 ‘Dogū, a Cosmos: Ancient Clay Figurines,’ and in particular Professor Rousmaniere’s lecture are opportunities for the Institute and its community of scholars to promote the Institute’s broad range of activities in Japan.